Those of you who have an adventurous streak, would probably first associate the Bloukrans River Bridge as the home to the world’s highest commercial bungee jump, before considering the incredible engineering feats that went into building it. 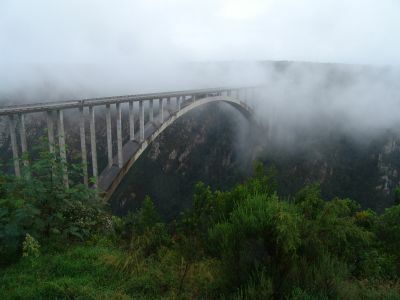 Situated on the N2 highway east of Plettenberg Bay in the beautiful Tsitsikamma region, it is the world’s largest single span concrete arch, the highest and largest bridge in Africa and the third highest bridge in the world. Built by a consortium of Murray & Roberts and Concor for the NTC, it was completed in 1984 and stands at height of 216m above the Bloukrans River. Its central span is 272m and the bridge is 451m in length. While traffic passes overhead, bungee jumping takes place from the arch below the road deck. Masterbuilders.co.za recently ran a feature on outgoing Murray & Roberts CEO Brian Bruce who as a young man of 29, was in charge of its construction. CLICK HERE to read Brian Bruce article.